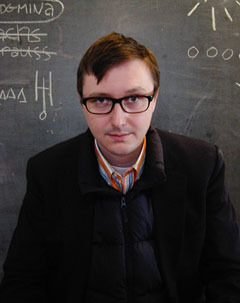 Expert John Hodgman will explain and illustrate most every subject you can imagine, including: how to enjoy fine wine, how to commit the perfect crime, how to make money and find happiness as a deranged millionaire, the coming global superpocalypse known as RAGNAROK, and also, if pressed SPORTS. There will also be some ukulele playing. ^That was the write up sent to me by Hodgman’s agent. I figure most will feel the same as I did when I was told “John Hodgman will be coming”—Who is John Hodgman? However, after seeing his picture I remembered seeing him slightly often on John Stewart’s The Daily Show and also as PC personified in Apple’s “Get a Mac” ad campaign. Now that I know who it is I am fairly excited for his stand up. This latest novel “That Is All” is the final book in the installment of a series of books he wrote, containing a number of subjects that will be punch line of his routine. He will be coming to the State Theatre on March 16th, so it will be a nice chance to keep the spirits of the spring break going for just a little bit longer. For more information or to purchase tickets visit The State Theatre website.